In the aftermath of the Great Reawakening, the world is a different place. Magic has returned, and people across the globe are turning up Latent, Manifesting in any one of a handful of schools of magic. Those who Manifest in the legal schools (Pyromancy, Hydromancy, Terramancy, Aeromancy, Physiomancy) have the option of joining the Supernatural Operations Corps, and using their newfound skills for the good of mankind. Those who run – Selfers – are considered dangerous criminals, and eliminated accordingly. Those who Manifest in one of the Prohibited schools – Probes – don’t have the same luxury; their skills are much more rare, but much more dangerous, and they are dealt with quickly. Lieutenant Oscar Britton is a Marine helicopter pilot assigned to a team whose job is to provide support to SOC when dealing with Selfers or Probes; he’s well aware of the consequences, so when he Manifests in one of the Prohibited schools – Oscar has the ability to open doors to another dimension – he runs. Hunted down and captured, he discovers that the rumours of a secret training base are true: Oscar finds himself enrolled as a contractor and dropped into the middle of a secret war in a different world. 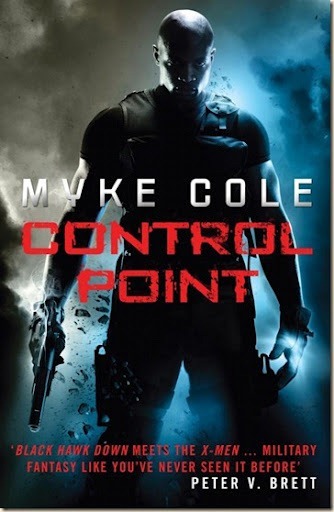 Myke Cole sets the tone of Control Point – his first novel, and the start of his Shadow Ops series – very early on. The action starts almost from the first page, and the story progresses through a series of action-packed – and, often, breath-taking – set-pieces to an arbitrary point that acts as the end of the book (think of the final sequence in The Empire Strikes Back, which is less an ending, and more a quick breath between two action-packed chapters of a larger story). When we first meet Oscar Britton, he is flying into action as part of a team tasked with bringing down a pair of Selfers. Britton is a career army man, but the actions of the SOC and the necessity of their mission – namely the murder of two teenagers – play on his conscience and he finds himself questioning his loyalties. This is a theme that runs throughout the book and, while some of his interior monologue comes across as decidedly whiny, it gives the reader a reason to root for Oscar – he’s a man of principles, the man we hope we would be, should we find ourselves in the same situation. Unusually for this type of fast-paced action story, Control Point comes with a vast amount of backstory, drip-fed to the reader through chapter headers and conversations between characters. It’s here that we learn about the disaster at the Lincoln Memorial that led to the current controls on magic, about the Native American insurgency that forms a background to much of the story and about the different schools of magic, and the controls enforced on them. On top of this backstory, Cole has created an alternate dimension – the Source – and a race of beings – the Goblins – that inhabit it, and it is here that much of the novel’s action takes place. The marriage of magic and state-of-the-art military technology works well, and adds a layer of realism that might otherwise have been missing. As with Marvel’s X-Men or Samit Basu’s Turbulence, Cole also examines the relationship between these new magical post-humans and the rest of the human race, and we find similar themes coming through: distrust, fear, power-hunger. Control Point is what it is: a scene-setter, the first part of a much larger work that promises to be the very best of military fantasy. As Oscar completes his training, we move from one fight scenario to another, each one designed to show not only what Oscar is capable of, but also the capabilities of his colleagues and his enemies. At times it feels slightly disjointed, like these are individual short stories whose only common denominator is the characters that populate them, but it is the most effective way to show us what we need to know for the coming instalments of the series. “Show, don’t tell” is advice often given to writers, and Cole does just that, giving us everything we need without slowing the pace or interrupting the flow of the story. Smart, funny and packed to the endpapers with action, Control Point is a fast, fun read that sets up what promises to be an exciting new series. Myke Cole has written a first novel that finds the perfect balance between action and story, and filled it with characters compelling enough to make us want to learn more about them. The ending-that-isn’t is the perfect stopping point, and the perfect ploy: there is more to come, and anyone who has read this far is unlikely to want to miss it. A blend of military, fantasy and science fiction, Control Point and the Shadow Ops series will have broad appeal, making Myke Cole one to watch.